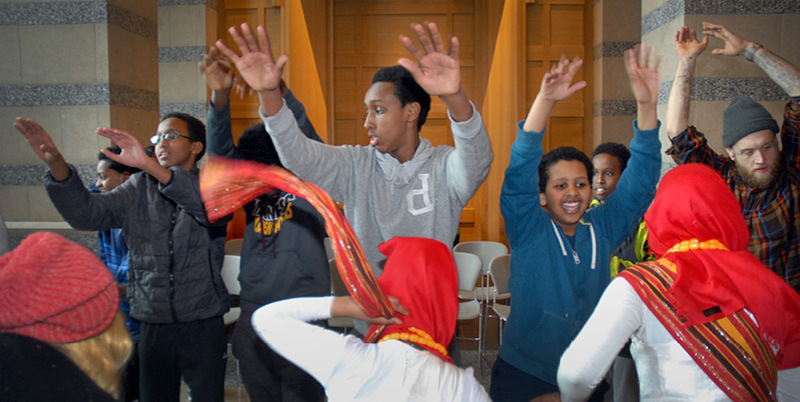 Back by popular demand to celebrate of the final weeks of the "Somalis + Minnesota" exhibit, join an evening of dance and weaving led by members of the local Somali community. In the weaving workshop, learn a finger weaving technique using no loom or frame, which Somali nomads use to weave mats by hand to cover their houses. The hands-on, immersive workshop will be led by teachers Ardho Ismail, Amina Shire, and Hawa Aden. The dance workshop will be led by the Somali Museum Dance Troupe, which studies and perform traditional dances from all regions of Somalia. Comprised of teens and young adults from the greater Twin Cities area, the troupe has performed for countless corporate, private and public events, with events taking place all across Minnesota, North Dakota, Virginia, Ohio, and Texas. Join instructors to learn dances like the Jaandheer. Meaning big leap or step, Jaandheer originates in northern Somalia and is performed at most Somali weddings and festive occasions. Each workshop will cycle twice so that guests have the opportunity to explore both. Workshops are for all age and abilities.